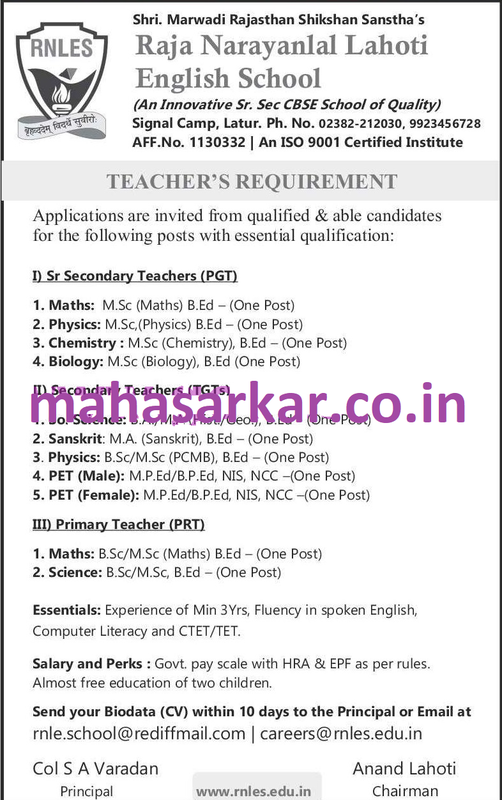 RNLES Latur (Raja Narayanlal Lahoti School Latur), Latur published a new job notification for Senior Secondary Teachers(PGT), Secondary Teachers(TGT), Primary Teacher(PRT) Posts. The recruitment is for total 11 Vacancies. The willing candidates are informed to see the latest notification March 2019. Last Date of Online application is 25-03-2019. For More details of RNLES Latur Recruitment 2019 Read Below. Education Qualification: M.Sc. B. Ed./ B.A/ M.A/ M.P.Ed/B.Ed. NIS, NCC/ B.Ed. and More. For Post wise Education Details follow the detailed advertisement. Application starts Online 18-03-2019. Last Date of application is 25-03-2019.